Thelma Eilers, 89 of Sterling, died Friday December 20, 2013 at Coventry Living Center. 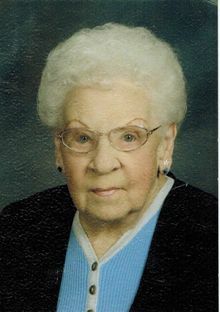 She was born on March 11, 1924 in Tampico, IL the daughter of Harry Herman and Frances Marie (Karn) Rosene. She married Lester F. Eilers on October 31, 1945 in Little Rock, AR. He died September 15, 1999. She was a member of Good Shepherd Lutheran Church. Survivors include her daughter, Kathleen (Dennis) Devers of Rock Falls; her son Douglas Eilers of Rock Falls; 5 grandchildren and 8 great grandchildren. She was preceded in death by her parents; her husband; 4 brothers and 3 sisters. Visitation will be held on Monday, December 23, 2013 from 10:00-11:00 A.M. at Good Shepherd Lutheran Church in Rock Falls. The funeral will follow at 11:00 A.M. at the church with Reverend Daniel Behmlander officiating. Burial will be at Hopkins Cemetery. In lieu of flowers, memorials may be made to Coventry Living Center in Sterling and Good Shepherd Lutheran Church in Rock Falls.